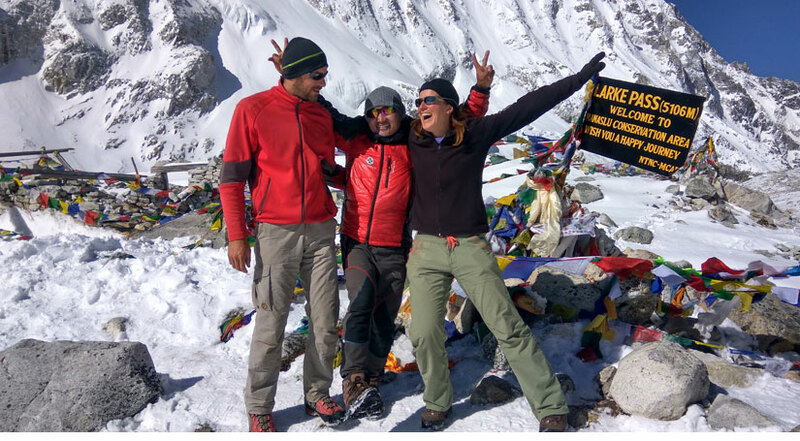 On the top of Larke pass 5,106 m.
Manaslu Circuit Trek is an amazing 18 days journey to the pristine Himalayan region of Nepal. 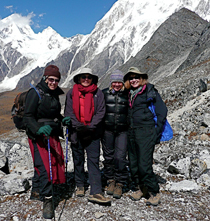 As you trek into the Manaslu Conservation Area, each day you get a different experience. The region inhabits wildlife like blue sheep, Himalayan Thar, snow leopard, red panda, and more. Not just that, the forest in this region is also rich in medicinal herbs. In this trek with Himalayan Joy Adventure, you will have breathtaking views of several peaks including Manaslu, Ganesh Himal, and Himalchuli. Also, the Budhi Gandaki River accompanies you throughout the journey. As the third day of trek takes you to Arughat of Gorkha district. The next day, you begin your trek towards Laubesi and one more day trek takes you to Khorla Besi. From there, you will walk through beautiful villages and rhododendron and oak forests to Ghapsya in three more days. From Ghapsya, you will hike to Lho village in the next day from where you can get the majestic views of Manaslu. Then the next day, you will have a short hike to one of the most beautiful villages of Manaslu Region - Samagaon. You will spend one day acclimatizing in Samagaon. There are so many attractions in Samagaon including the famous Birendra Tal which is about half an hour walk from the village. So, you can enjoy the day exploring the area. Then, you will walk to Samdo Village another day and then to Dharamshala the next day. On the fourteenth day, you will cross the famous Larkya-La Pass and then trek to Bhimthang. From Bhimthang, you trek for a couple of days to join the trail of Annapurna Circuit to wind up your trek in Jagat. The next day, you will travel to Besisahar by jeep and then to Kathmandu the same day. After breakfast, our city guide will take you to various historical places and world heritage listed sites. These will include Pashupatinath (One of the greatest Hindu temples in Asia), Bouddhanath stupa (Buddhist stupa), Swayabhunath (Buddhist stupa, also known as the Monkey Temple) and Kathmandu Durbar Square (home of the living goddess Kumari). After sightseeing, you will be dropped at your hotel with time to prepare for your trek. Overnight in Kathmandu. 03 Days DRIVE TO AARUGHAT 608M. On the third morning, you will travel to Arughat which takes about 8 hours jeep ride from Kathmandu. With beautiful mountains and landscapes sceneries, it will be a beautiful journey. Arughat is a Newar and Gurung Village of Gorkha district. 04 Days TREK TO LAPUBENSI 884M. Today, the trek begins. You begin the trek with a mesmerizing view of the Ganesh Himal. You will trek through a dusty road to Soti Khola for the lunch. Many trekkers prefer driving directly to Soti Khola where the road ends. After lunch, you will pass through Budhi Gandaki River and waterfalls to reach Lapubensi. Lapubensi is a Gurung Village located at 884 meters. 05 Days TREK TO KHORLABENSI 970M. You will trek alongside Budhi Gandaki River to reach Machha Khola. Many trekkers spend their night in Machha Khola. But, you trek further and cross a bridge and continue your trek to Khorla Bensi. Khorla Bensi has a couple of attractions including an organic coffee garden and breathtaking view of Ganesh Himal. 06 Days TREK TO JAGAT 1340M. From Khorla Bensi, you begin the trek by ascending to Tatopani. Tatopani has a natural hot spring where you can relax in a natural hot water. You will then continue your trek and cross the Budhi Gandaki River. After passing through several streams, waterfalls, and villages, you will stop at Thulo Dhunga for lunch. From there, you continue your trek for the day until you reach Jagat. 07 Days TREK TO DENG, 1860M. From Jagat, you start your trek towards Deng on the seventh day which takes about 4-5 hours. You will cross Gandaki River and then continue your trek. The trek is rewarded with breathtaking views of Siringi Himal. After having your lunch, you continue your trek until you arrive at the small village of Deng. Deng is located at 1860 meters. 08 Days TREK TO GHAPSYA, 2397M. Most part of today’s trek is uphill. After your morning breakfast, you begin the uphill climb to Rana Village. You pass through several teahouses and view the amazing landscapes on the way. You will reach Ghapsya after about 5-6 hours of walk. Overnight stay at a teahouse in Ghapsya. 09 Days TREK TO LHO, 1800M. Today, you walk through the trail that passes through rhododendron forest for about two hours. You then reach Namrung, a beautiful village where many trekkers prefer to stay. The village provides you with breathtaking views of Ganesh Himal and Siringi Himal. The village also has some other attractions including a monastery and a hydro-power. Namrung also has the permit check post. From Namrung, you continue the uphill climb to reach Lho. You can get the stunning view of Manaslu from Lho. 10 Days TREK TO SAMA GAON, 3520M. Lho to Samagaun is only about 3 hours walk. So, you have enough time to walk slowly and rest at multiple places. You will have a nice walk along a river to a small village of Syala. You can stop at Shyala for tea. Sama Gaun is a beautiful village based at the lap of Manaslu. It has a few lodges and a primary school. As you arrive at Sama Gaon, you can spend your time to relax and explore the gompa that lies just above the village. Today is the acclimatization day. You spend the day resting and acclimating your body. You can have a side trip to Birendra Tal that offers you a majestic view of Manaslu. The icy blue water lake just below the Manaslu looks so pristine and beautiful. You will see so many stacked rocks on the way..
12 Days TREK TO SAMDO, 3875M. Today, you trek for about four hours to Samdo. You will walk along the Budhi Gandaki River and pass through meadows and huts. You will also cross the tree line on the way. 13 Days TREK TO DHARMASALA, 4460M. You trek for about three hours today. The total trekking distance is about 8 kilometers. You will cross the Larkya Bazaar situated at 4090 meters. This was once a part of salt trader’s route. You will then continue ascending to Dharamshala by enjoying the amazing views of mountains and meadows. It may be quite cold in Dharamshala as it is located at 4460 meters. 14 Days TREK TO LAKYA-LA PASS 5160m. – BIMTHANG, 3590M. Today is a long and tiring day. You have to wake up early in the dark morning and begin the walk. You ascend more than 650 meters to reach the Larkya-La Pass and begin descending down to Bhimthang. Your pace may be as slow as the snail movement in such a high altitude. You will reach a teashop after about two hours of the walk where you can enjoy hot tea and continue moving. As you reach Larkya La Pass, you have a sense of achievement that you have done it. Larkya La Pass is the highest you will reach in the trek. Then, you begin descending down to Bhimthang. You will cross the rockfall area, you can reward yourself with a cup of tea and even a lunch in a tea stand. And, as you reach Bhimthang, get yourself a proper rest from the long and enduring walk. 15 Days TREK TO GOA, 2515M. Today, the trek is not so long. After spending your morning in Bhimthang, you will begin descending to a river. You will walk through rhododendron and pine forest on the way. You will then pass through several teahouse and meadows to arrive at Kharche for lunch. After a hearty lunch, you will continue your trek to a beautiful Gurung village of Goa. 16 Days TREK TO JAGAT, 1300M. Today, you walk for about 6-7 hours to Jagat. As you descend to Dharapani, you will join the Annapurna Circuit Trail at Dharapani. From there, you continue your trek and arrived at Tall village for lunch. Taal is a beautiful village with a nice waterfall. After lunch, you will continue your trek until you reach Jagat. Today, you will drive to Besisahar in a local jeep and then to Kathmandu. Once you arrive at Kathmandu, we will transfer you to your hotel. We will drop you at the airport for your further destination. 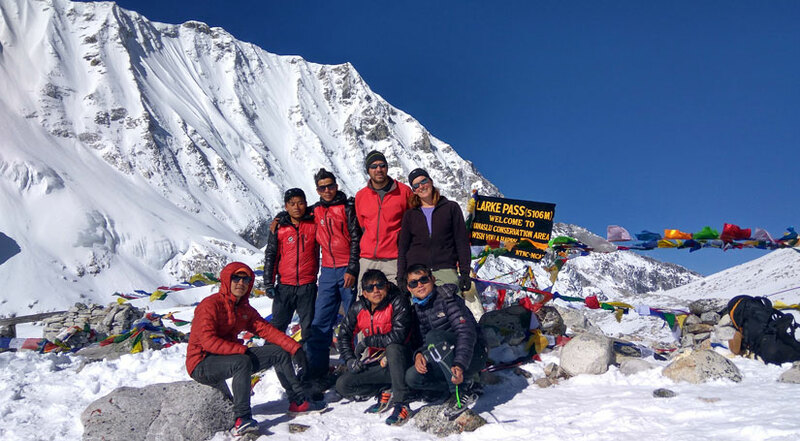 We hope that you had an incredible time in the Manaslu circuit trek and encourage you to share your experiences with us on Trip Advisor or email. We welcome all feedback and hope that you had an experience of a lifetime with us! Have a safe flight! Wir hatten geplant, den Manaslu Circuit als Tea House Tour zu machen. Während der Suche nach einem Guide wurde uns die Agentur empfohlen und können die Agentur auf jeden Fall weiter empfehlen. Wir waren mit unserem Guide Tika Rai sehr zufrieden. Auf der Tour haben wir gesehen, was wir an ihm hatten. Er hat alles bestens für uns organisiert, er kannte alle Tea Houses und hat, dort wo es überfüllt war vorab reserviert. Er kümmerte sich wirklich rundum, achtete auf die Zubereitung unseres Essens, informierte uns über Kulturelles und gab uns eine kleine Einführung in den nepali Lifestyle. Er ging gut auf unsere Wünsche ein, so konnten wir an manchen Tagen unser Laufpensum ausweiten. Er organisierte dann problemlos alternative Tea Houses für uns. Unser Treck war nicht ganz einfach, da es fraglich war, ob wir den Larke Pass passieren können, nachdem es eine Wintereinbruch gegeben hatte. Wir entschieden gemeinsam, dass wir das probieren wollten und kamen schließlich gut über den Pass. Ein großer Dank an Tika, der uns eine tolle Zeit am Manaslu ermöglicht hat. Cholandra is an amazingly fit person. I’ve seen him balancing on one foot in the middle of a rushing river carefully setting stoes so we could cross. He never once slipped doing this long task. His sweet caring personality was always refreshing. Every day the world is facing a big issue of environmental pollution and in Nepal as well. Our field staffs are quite conscious about environmental pollution at any time and we encourage to all. We would suggest to our guest to use boiled water or water purification pills than buying a bottle of water, it helps to avoid plastic bottles which can takes long time to disappear. During the trek, if possible you can order same items food in a group which minimizes the fuel used and to make campfire is almost forbidden. We would encourage being a responsible traveler so, just leaving foot-print on the trail and bring out all non-biodegradables which you had.